Students’ perceptions and attitudes toward math are linked to careers they feel confident in pursuing. Although student attitudes in math have been heavily researched, attitudes of employees in STEM careers are less understood. We interviewed 25 new hires and managers to understand the attitudes and perceptions of mathematics done in the workplace. Using an emergent qualitative coding process and value coding we explored how employees valued math on the job, perceived the difficulty of math they used, and their confidence in their math abilities. Knowing this information can help bridge the gap between what math students learned in school and what math is used outside of school and in the workplace. High-level project overview: Many scientists, engineers, and students use the programming languages C, C++, and FORTRAN. Scientists who use these languages to conduct their experiments set up their programs to run in sequence -- what computer scientists call "serial processing." In order to make the best use of the state-of-the-art High Performance Computing (HPC) platforms to run more efficient experiments or to run very large simulations, the programs written in these languages need to be able to run simultaneously, what computer scientists call "in parallel" as distinct from "serial". Enabling the parallelization of the applications and software, however, remains a challenge. An Interactive Parallelization Tool (IPT) is being developed in this project. IPT will help scientists, engineers, and students build on their customary use of C/C++/Fortran to create more efficient programs that can run on advanced HPC platforms. IPT will be made available to the community as open-source code, and also through a web-portal for convenient code generation and testing on computational resources of the national cyberinfrastructure (CI). The autonomous free-flying robot Astrobee, designed for the ISS, localizes on a sparse visual map in six degrees of freedom using an Extended Kalman Filter. Currently, the Astrobee team conducts numerous tests to ensure Astrobee's localization will succeed on the International Space Station (ISS). 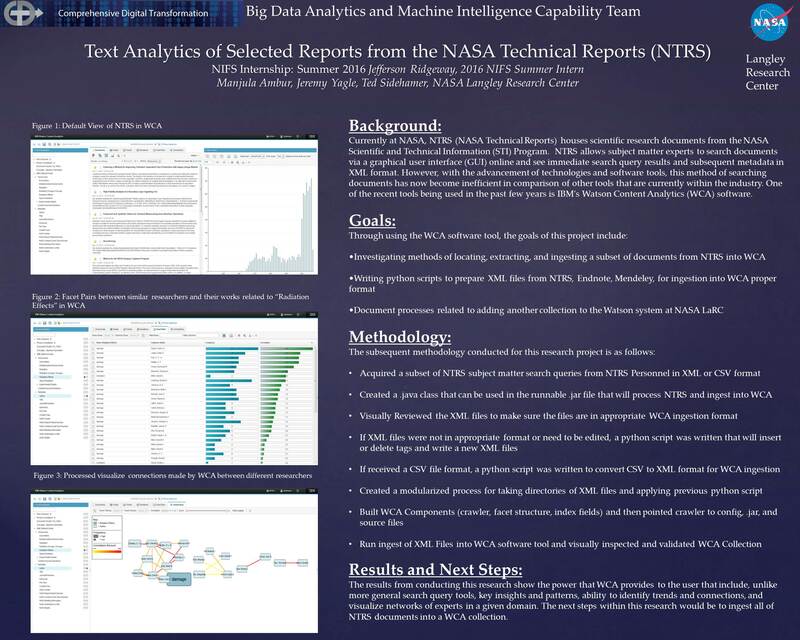 However, in testing different mapping and localization algorithms for Astrobee, the method of manual trial and error has been used against individual test cases to determine whether the change was a success. Hence, we are creating a regression testing system to utilize in lieu of trial and error on specific tests, which has proven to be ineffective. The regression testing system will automate the testing process and show the Astrobee engineers how their changes affect the localization system, as the EKF is highly dependent on small changes and provides a complex output challenging for humans to understand. Furthermore, this research seeks to analyze the results of the testing system and then visualize the results in easily understandable ways. The regression testing system is extensible and prepared to be used on new tests created on the ISS when Astrobee launches next spring. Software safety analysis as we know it does not look at functional and safety requirements simultaneously. Functional specifications are typically modeled with a UML state diagram and a Fault Tree Analysis (FTA) is generally used to delineate the causes of hazards. By using an integrated approach, a more thorough look into possible system failures is produced. In other words, creating a model that shows how a system is designed to work, while also describing where issues can occur, leads to a better, safer system. A case study is done using a stair-climbing wheelchair. Functionality and safety hazards are modeled after the case study. The immediate research goal is to create a new model that combines the case study diagrams together. This goal was met and the new model gave more insight into possible failures than the FTA and UML state diagram did individually. The next step is to use this method on a different system. Eventually, a model will be created that can be used with any safety-critical system. Numeracy pertains to a person’s ability to understand numbers. A person’s level of numeracy is developed as soon as they enter into grade school. During that stage, people are learning the basic and essential mathematical skills associated with building their numeracy. When numeracy is associated with higher education, this focuses on adults and how they understand numbers. Adults are also viewed as being numerate or innumerate. Numerate means having a high level of understanding when using numbers while innumerate means having a low level of understanding when using numbers. A person’s level of numeracy becomes important when facing real world situations and problems. This is most commonly found in situations pertaining to probability and chance. Probability and chance become a main focus every day because as soon as a person wakes up, they begin making decisions and weighing their options. These decisions can range from something small such as deciding what to wear to something large such as scheduling what time to take certain medications. Numeracy is essential for everyday life considering there are many factors that can affect a person’s decision-making skills. The Science Gateway Community 4-Week Coding Institute was a rigorous coding workshop that was held with the intentions of teaching undergraduate students about different programming languages including Python and Unix Shell. During the first week of the workshop Dr. Hayden introduced the students to the SGCI program as well as the activities that the students would be expected to complete during the duration of the program. Following the introductory week the students were introduced to the Software Carpentry team as well as new programming languages. During the Software Carpentry tutorials the students were introduced to git bash as well as GitLab.com. The students were taught how to use the Linux terminal to navigate GitLab.com and how to save their work. Along with the Software Carpentry tutorials the students also learned a few different programming languages such as R, Python, and Unix Shell. After the tutorial portion of the workshop the students traveled to New Orleans to attend the PEARC17 conference. During the PEARC17 conference the students participated in a verity of different events and activities. One event that the students attended was a Python tutorial in which students who haven’t had any experience in the Python programming language would be taught the basics. The tutorial sessions were about one hour and thirty minutes. Given the limited amount of time, the tutorial was well planned out and perfectly timed. The tutorial included lessons on how to import modules as well as create and call a custom or built-in function. Student modeling day was another event that help the students interact with one another. The object of modeling was that the students would split into groups and work together to solve and plot a scientific problem using python. An example problem during modeling day was the infection and immunity rate of malaria on a population of villagers as well as the spread of malaria amongst the mosquitos. In conclusion the Science Gateway Community Institute 4-Week Coding Internship offered a great opportunity for students to gain experience in different programming languages as well as applying their skills to scientific problems. The goal of this project is to create a proof-of-concept science gateway for the acquisition, storage, sharing, analysis, and visualization of social media data, named the Social Media Macroscope. The Social Media Macroscope will provide an innovative, easy-to-use, and powerful science gateway for research utilizing social media data. It will make utilizing social media data with data science approaches more accessible to researchers and will provide a collaborative platform in which researchers from various areas create synergy in novel projects using social media data. The nanoHUB website is a National Science Foundation funded nonprofit that engages the nano community. It is the largest resource hub for nanotechnologies. As a proud grant holder, nanoHUB serves the global community with its services. Similar to many other grants it does not last forever, many grants have a certain timelines in which they end. Therefore, nonprofits like nanoHUB are tasked with finding financial sustainability after the grants ends. This research with nanoHUB identifies different ways for nanoHUB to be self-sustaining. I am to look at previous work done by the MBA student’s surveys and continue the survey process while trying to improve the questions. The changes are based on research papers and other suggestions for best practices. The goal is to create a better survey for nanoHUB. The survey should reach the correct amount of demographics is accordance to the average users base. As the results show the survey was represented accurate on male to female demographics however, the student to professor section is different from the average. The reasoning for the results is discussed further in the research. In order to perform autonomous sequential manipulation tasks, perception in cluttered scenes remains a critical challenge for robots. For this problem there was a previous research project that proposed a probabilistic approach for robust sequential scene estimation and manipulation - Sequential Scene Understanding and Manipulation (SUM). SUM considers uncertainty due to discriminative object detection and recognition in the generative estimation of the most likely object poses maintained over time to achieve a robust estimation of the scene under heavy occlusions and unstructured environment. However a new problem arose, this problem was with processing of the scene and the tracking the objects. This new problem comes from congestion information when processing the scene. Therefore, a method for reducing this congestion in processing came in the form of a cluster. The cluster is built from the desktops and a laptop (nodes) that were already in use within the lab. The laptop and all of desktops all run a Linux based operating system, near field communication (nfc) to share the files, OpenMPI to send messages between all of the nodes, and ganglia to monitor the cluster. The team compared the results of a test code that ran on different number nodes of the cluster. These results showed that as the more and more nodes were added, the time to render actually did come down. It also showed that since some of the machines were more powerful than others that it would be also more useful to put multiple graphics cards on a single machine. The goal of the project was to extract data from Wikipedia regarding a specific cohort to monitor the effects that Wikipedia’s current system of maintenance and management has on the users that are active during said time. We observed the factors that may cause members of said cohort to remain editing within Wikipedia or to abandon Wikipedia altogether. Knowing the potential leakage inside SGX enclave caused by software vulnerabilities, new understandings are needed to mitigate the threat. From that which is known, two recent works are published on this topic. 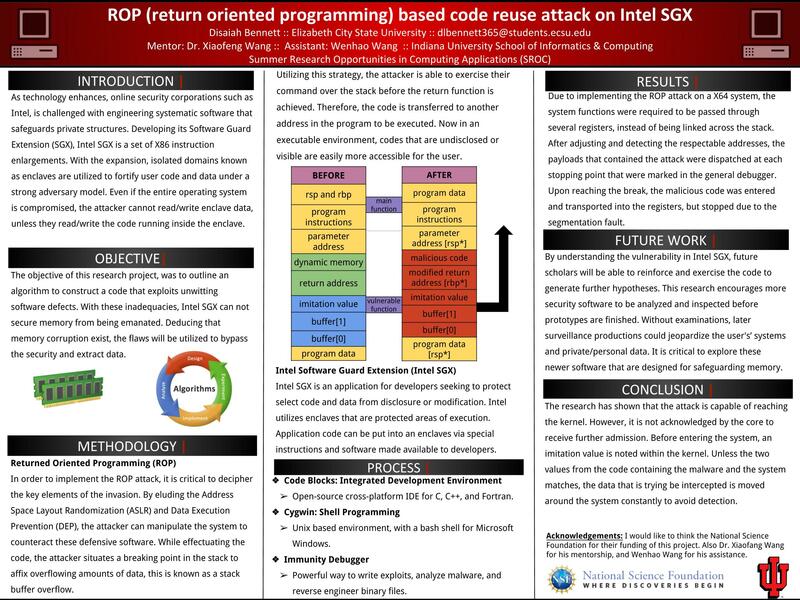 SGX-Shield at NDSS'17 proposed load-time randomization, and "Hacking in Darkness: Return-oriented Programming against Secure Enclaves" to appear at Usenix Security'17. By following the research routine: a basic attack outside SGX to understand ROP, the ROP attack inside SGX enclave, and JIT-ROP to bypass SGX-Shield. After we can propose mitigation strategies, such as run-time live re-randomization. Both parts of JIT-ROP inside SGX and run-time live re-randomization are research problems we can try to solve.